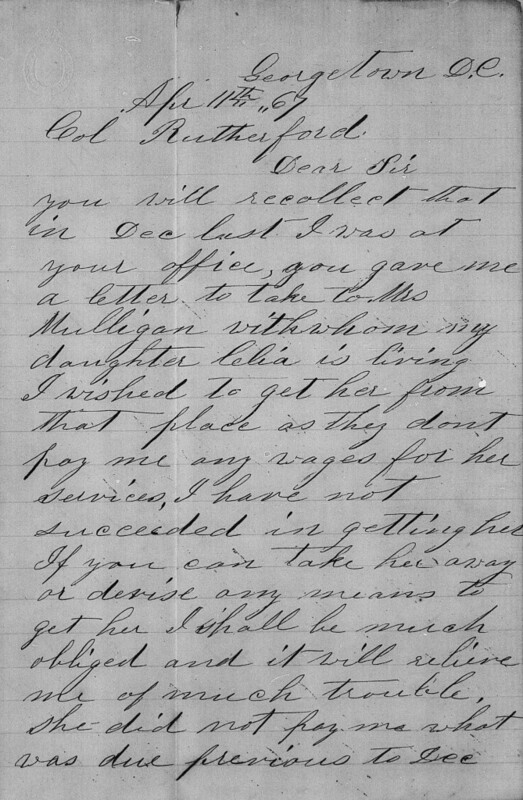 You will recollect that in Dec last I was at your office, you gave me a letter to take to Mrs. Mulligan with whom my daughter Celia is living. I wished to get her from that place as they dont pay me any wages for her services. I have not succeeded in getting her. If you can take her away or devise any means to get her I shall be much obliged and it will relieve me of much trouble. She did not pay me what was due previous to Dec. Also another girl at Mr. Jingles, named Mary Prater, my granddaughter the weather was so bad during the winter I could not see to her or go there. I am in need of their help and would like to know where she is if she was left in that vicinity when Mr. Jingles moved to Penna. if so can she be sent to me in Georgetown Montgomery St. Ellen Lee. The name of my daughter is Celia Lee at Mrs. Mulligans and the granddaughter I suppose is in the neighborhood where Mr. Jingles lived with a colored family by the name of Bonny Lisle, Below Rockville you will confer a great favor if you see to this for me. 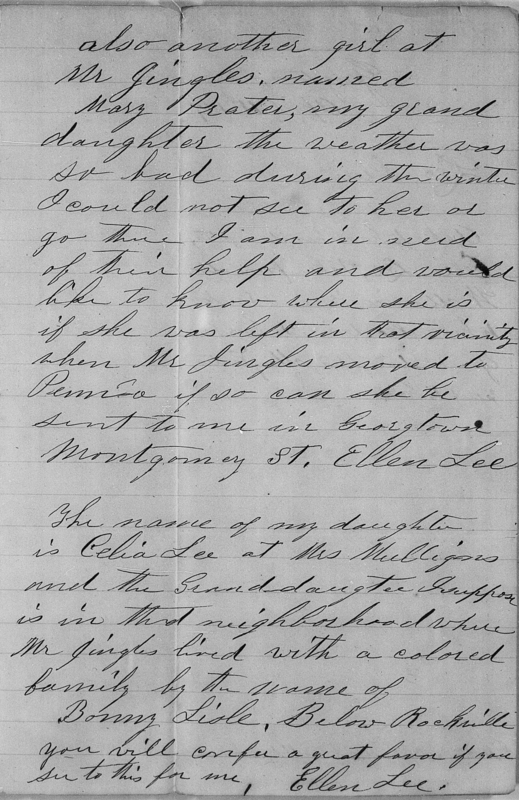 “Maryland and Delaware, Freedmen’s Bureau Field Office Records, 1865-1872,” images, FamilySearch (https://familysearch.org/pal:/MM9.3.1/TH-1971-27448-10704-22?cc=1989156&wc=9C3M-DP6:266115201,266115202 : accessed 27 December 2014), Wilmington, Delaware > Roll 42, Letters received, May 1867-July 1870 > image 3 of 44; citing NARA microfilm publication M1906, National Archives and Records Administration, Washington, D.C.